In passing Mr C mentioned he would like to eat healthier. My response "Challenge accepted". Mr C is a competitive swimmer and eats enormous amounts of food and does have a liking for carbs. I must admit his daily diet is pretty good but like everyone, except perhaps vegans, could do with more veggies in his diet. Inspired by lots of green foodie shots streaming through my Instagram feed I decided to veggie up the traditional Mac & Cheese. Firstly, blanch a bag of baby spinach and a handful of parsley. After squeezing out the excess water blitz the spinach with a small amount of cream (if this is not on hand Ricotta would make a nice substitute). Set aside until needed. Cook pasta according to directions, chill under cold water. Start with your basic bechamel sauce. Melt a good dollop of butter and add plain flour (a good 2 TB), cook for a few minutes over low heat making sure your roux does not colour. Add a little crushed garlic, Dijon mustard, salt and pepper. Gradually mix in milk, cooking until it reaches a consistency similar to thin custard - we will be thickening it up with CHEESE! Add a good amount of grated cheese, I used parmesan and a sharp cheddar. I usually take my pan off the heat for this step until the cheese is melted. Add in the blitzed spinach and pasta to warm though. Taste for seasoning, add more S&P. 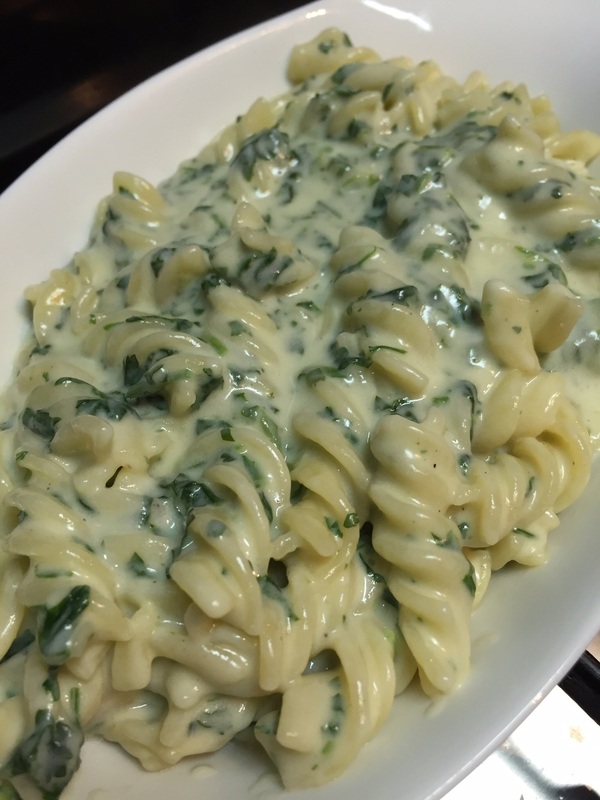 Easy as that - Green Mac & Cheese (or in this case spirals..but you get the picture). Once heated through you can always put the mixture in a bowl add more cheese over the top and place in the oven. However, I find the pasta can go a little gluggy and the mixture dry as the pasta continues to absorb moisture. If you would like a cheesy top I would suggest a scattering of cheese and breadcrumbs and a quick blast under a griller. I would have like a more green goddess like sauce, but will keep working on it. Maybe the addition of broccoli and some blitzed spring onions?